Why do consumers like copycats? What makes copycats successful? 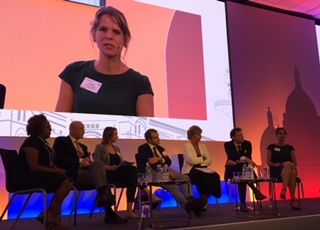 Femke van Horen, Vrije Universiteit Amsterdam, The Netherlands introduced some psychological perspectives to trade mark law in her presentation during today’s MARQUES Annual Conference session “Design Your Mark”. The panel was chaired by Lydia Gobena of Fross Zelnick Lehrman & Zissu. Drawing on research about consumer attitudes and the assimilation effect, Femke (pictured far right) presented insights into the factors that influence perceptions about copycats, including: How much is copied? What is copied? And where is it copied? The research covered brands such as Bertolli, Milka and Tropicana, and showed that consumers actually like copycats with moderate similarity more than those with high similarity. “A thematic imitation is far more successful,” she explained: “Blatant similarity is disliked, whereas subtle similarity is liked. And consumers think different than lawyers may think.” The latest marketing research focuses on using fMRI studies of brain activity to supplement self-reports. Stefan Völker of Gleiss Lutz and Tom Scourfield of CMS presented the results of two MARQUES surveys on colour and shape trade marks covering 25 jurisdictions, covering topics such as acquired distinctiveness, the importance of surveys, graphical representation/description and enforcement. The full results of the surveys will be posted on the Class 46 blog shortly, and submissions are welcome from other jurisdictions. The panellists – Giordano Cardini of Ferrero, Birgit Choudhry of Red Bull GmbH and Sandrine Royer of Nestlé Legal – discussed practical questions about the challenges of protecting and enforcing the designs of new and established products. Topics covered included how consumers perceive different aspects of brands and court decisions from Europe, China, South Africa and elsewhere on likelihood of confusion, unfair competition and passing off. Questions included when to file, what to seek protection for, the use of surveys and the criteria applied by the courts in cases involving non-traditional marks.